A seismic occurrence mechanism was thought a balance failure type explosion which occurred by the destruction of the magma chamber so far. As for the seismic occurrence cause, it found that it was the explosion of the dissociated water which dissociated by the heat. This explosion phenomenon was decided to be named a dissociated water explosion newly. The mechanism which an earthquake appears on is explained by using the figure. It defines to make an explanation easy to understand. The water which dissociated is defined as the dissociated water. Combined water is defined as the consolidated water. 1. A dissociation layer is usually stable. It is moved upward due to the pressure decrease and the rise in temperature. 2. 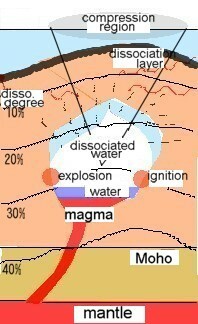 When a dissociation layer is raised, a consolidated water dissociates, and dissociated water (detonating gas) is made. Circumference temperature falls down locally. An earthquake sign occurs. 3. When temperature is recovered, a detonating gas ignites and explodes. It is a seismic occurrence. When it passes heat water condition, water inside the underground becomes super-critical condition. When it exceeds super-critical condition, water begins to dissociate in oxygen gas and the hydrogen gas.The layer of this limit is defined as the dissociation layer. This layer responds to the change in temperature and the pressure, and it is moved inside the underground to top and bottom.The degree of the dissociation rises in the dissociation layer due to temperature, the pressure and the existence of the catalyst material. 4. 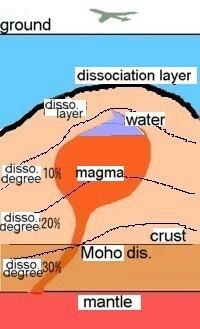 The inside of the magma chamber decompresses by the consolidation process. A magma chamber is crushed. Magma is raised again. 1. 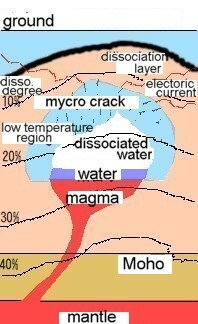 A consolidated water inside the dissociation layer is usually stable. 2. When the decline of the pressure or rise in circumference temperature occurs, the position of the dissociation layer rises, and the degrees of the dissociation increase. When it is raised rapidly, the mixed gas of the hydrogen gas and oxygen gas which dissociated is accumulated, and pressure increases inside the magma chamber. This increase in pressure makes micro crack occur in the rock board, and a seismic sign is set up. A sign phenomenon has the occurrence of the ground electric current, the occurrence of the unusual electromagnetic wave, a luminous phenomenon, and so on. A dissociation response is an endothermic reaction, and lowers circumference temperature of the magma chamber locally. 3. Rise in temperature happens because temperature will be changing from the circumference when a dissociation is finished.A detonating gas ignites and explodes when it reaches the explosion condition of the detonating gas. This process is the first step of the earthquakes.The direction of the explosion depends on the form of the magma chamber.Loud noise is raised like its personal experiences in the touzan earthquake at the time of the explosion. 4. 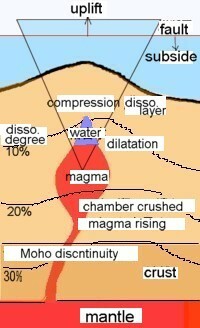 Pressure descends, and a magma chamber is crushed because mixed gas is returned in the water of the super-critical condition after the explosion. This process is the second step of the earthquake. Heat is radiated due to the explosion. A dissociation layer moves to the position before the earthquake.There is a movement of the ground that it is named a distribution of compression and dilatation in the arthquake phenomenon. A compression area occurs in the first step of the earthquakes, and a　dilatation area occurs in the second step of the earthquake. A fault appears in that boundary. This is a seismic scar, and a fault appears only at the time of the big earthquake.There is an observation example that it appeared in a fault after the earthquake to slide slowly.A seismic cause is not that a fault slides and moves. The above is the mechanism of the dissociated water explosion (detonating gas explosion). An earthquake appears when a dissociation layer is raised. That is in such cases as <When atmospheric pressure decreases.> <When rise in the magma is big in the full moon and the new moon.> <When the fatigue destruction of the crust progressed and a big crack occurred in the rock board.> .This doesn't contradict in the experiential fact as well. But, it doesn't need to think about the influence of the full moon and the new moon, the influence of the typhoon, and so on so exaggeratedly. It thinks that a forecast is possible just before the earthquake if the earthquake sign which occurs due to the dissociation is examined rationally. Specially, the big earthquake of M8 and M7 is thought that ANS can detect it with the magnet observation to be carrying it out fully in the case. It becomes stifling before the big earthquake occurrence. As for that, it is probably a cause that a dissociation layer is raised. And, an insect in the ground comes out before the big earthquake. An animal during the hibernation comes out from the hole. This will relate to the rise in the dissociation layer, too. But, this doesn't need to react excessively, either. A proper judgment is possible if the people have proper seismic knowledge.